Posted on 12 December 2014, in French Fridays with Dorie, Lamb, Winter and tagged French Fridays with Dorie, lamb, morocco, stew, tagine. Bookmark the permalink. 20 Comments. So glad you had a wonderful birthday celebration! You make this dis look far more appetizing than it sounds. It’s amazing that we are SO close to the end! This project has taken longer than college – LOL! Longer than college? That has me laughing. I hadn’t thought about the time frame relative to that, but you are right. This has been quite another kind of education, hasn’t it? I was actually looking forward to this dish. I have all the ingredients sitting in my fridge. However, I had so many things to do after being away for two weeks, I settled on a pot of Red Kuri soup! 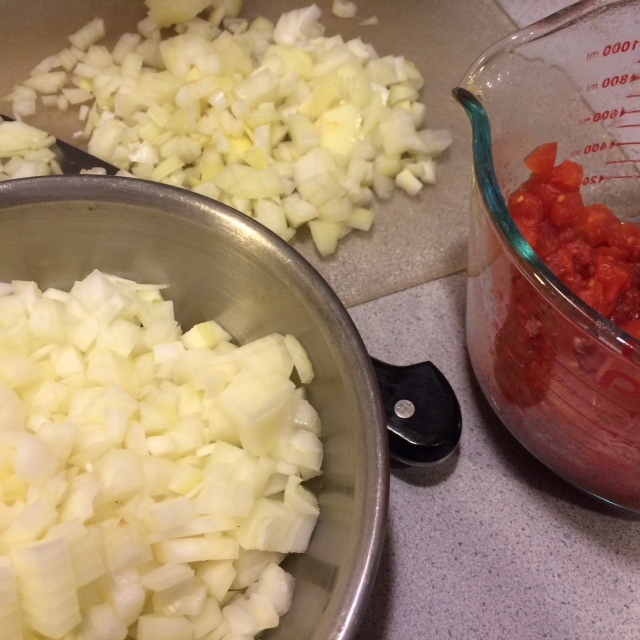 I will be making the tagine this week…yours looks so yummy! Can’t wait to give it a try! I think I will even add some carrots for Bill! I love birthdays, too, Betsy! I now know why I find your personality so appealing…your a fellow Sagittarius! 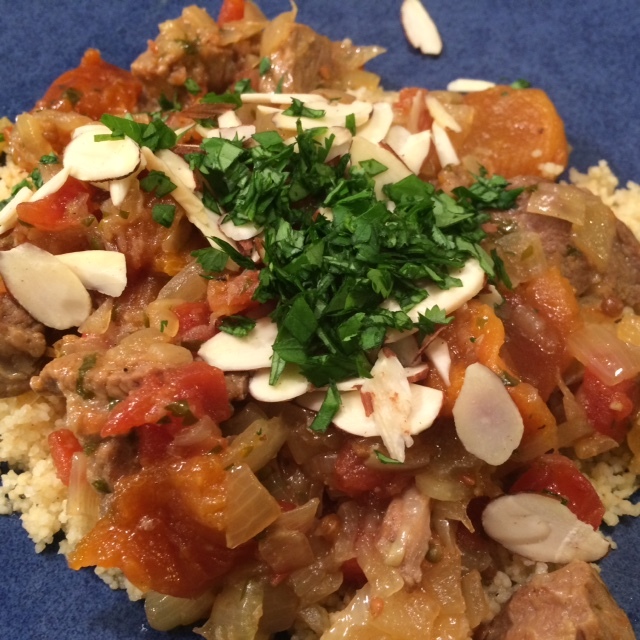 You will love the tagine when you make it! And yes, both being Sagittarius must explain why we have so much in common. Yeah, Bill probably would have given it a 2. He ate it but found the sauce too exotic. And it was the sauce that was so heavenly!!! That Bill! You definitely have a challenge on your hands. He seems less flexible in his food preferences than Howard. Yes, the sauce was heavenly! I used to listen to music while prepping in the kitchen, but in past year I’ve gotten an Audible account and now often find myself listening to a book while in the kitchen. I have learned that not all books work as audio books, but I’ve been listening to David Sedaris in the kitchen lately and loving it. I think David Sedaris is hilarious. When I had a long commute to work, I used to listen to audio books on the ride, and you’re right, not all books work that way. I chose lighter reads where I could tune out for a few minutes while I was negotiating traffic and come back without feeling I missed something. Now I’m completely addicted to podcasts, my own personal station of talk radio. I need to look that podcast up. You got me hooked on The Food Seen! There was so much sauce to go around, you can definitely sneak in a sliced carrot or two! You got me hooked on All Songs Considered a few years back. I’m so much more current in knowing the music out there. And when I love something on the show, I buy the song. Howard has noticed that my taste in new music is similar to what I listened to back in college, so I guess it’s different bands, same sound. Still an advancement for me. wonderful recipe and we both loved it. I would chop my figure off if I listened to Sedaris while cooking. He makes me laugh too hard. Little tip on undesirable ingredients i.e. dried fruit etc… chop them really small. My kids didn’t even realize what they were eating. All they noticed was a sweet taste in the stew. Glad you had such a great birthday–and a happy belated birthday from me! The stew looks beautiful and I’m glad you all enjoyed it so much! I am glad that Howard kind of, sort of liked it:) I loved this dish and the weather although not frightful but as least wet made it even better. I look forward to finishing all the recipes with the group. I still need to tackle salmon in a jar, and I made the same mussel recipe twice by mistake. Still need to make those up! 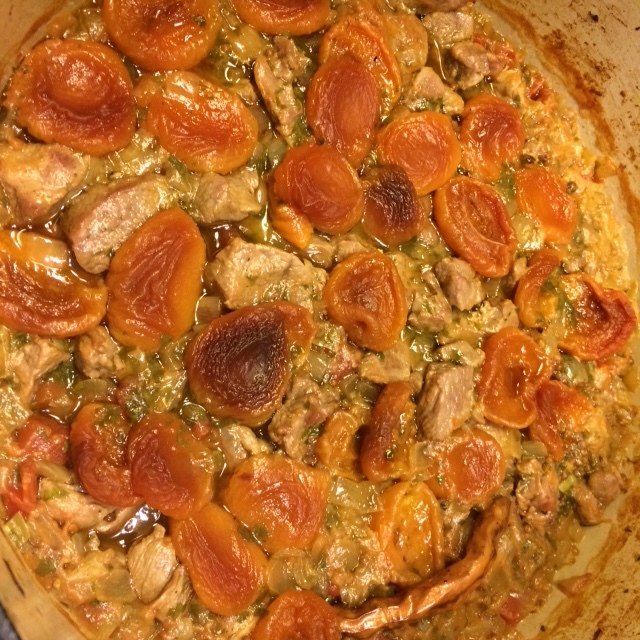 Your tagine looks superb – I loved this, and would eat stew at any time of year. I was wondering how this would go over with Howard. Will have to have to check out those podcasts. They are all new to me. Right now I am hooked on Serial (from This American Life) and have been binge listening to Stuff You Missed in History Class after a few weeks away from my iPod. I love podcasts with This American Life and The Moth being my favorites. Perfect accompaniments for a long walk. I will check out Heritage Radio; I’m not familiar with it. That’s pretty funny that Howard would give it a 5 if you’d used carrots but only a 3 since its apricots. 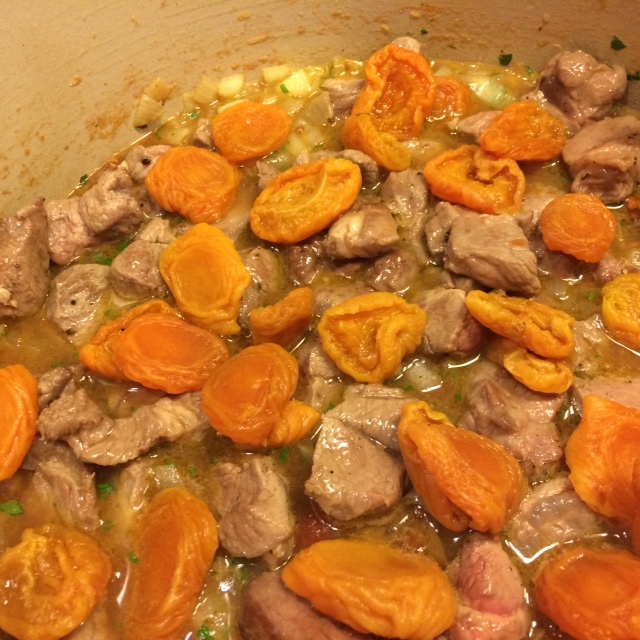 I plan to make it this week and I might use carrots and apricots.